I drove home and thought long and hard about the project. Here was a very tired, but original boat. Could we faithfully restore this boat or should we even attempt to? If we fitted a new bottom and a new motor and did all this woodwork, would the boat be the same, and if not, did it matter? I wrote to David and outlined all kinds of options and “what if” scenarios. 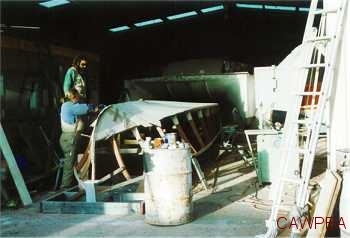 We later discussed this on the phone and it was decided that no decision would be made until I had the boat in my shop and had commenced the stripping process. Trust. David had a dream and I had his trust. 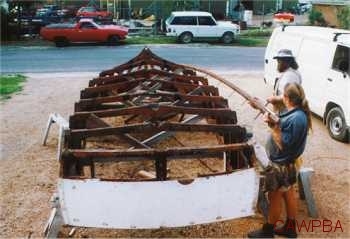 Those in the profession of wooden boat building, restoration and repair will understand the trust that our clients bestow on us. It is a wonderful thing and not to be taken lightly. We are the purveyors of our clients dreams and with it comes the responsibility of realising those dreams and keeping them alive during the often long, costly and sometimes arduous process of boat restoration. timbers were all that could be resurrected and at least I had the frames from which to make patterns for the new ones. Quite simply I told David and his understanding wife Pauline that I could rebuild his boat around what was left and that it would still be a Chris Craft from stem to stern! I also advised him that it would be a far more cost effective exercise to build a new boat from plans available. He wanted his old boat back, just better than it ever was. The process of marking out and setting up new frames, keelson, chine and sheer was onerous and at times tedious. Even more patience was needed to get it close to right. Our measurements were some help, more so was a fairing batten. With the old stem repaired and the transom framing married to the new keelson and framework set up over the new enlarged engine beds, we had the making of a real boat. It was a breakthrough and we were back on track. We laminated a plywood and mahogany transom and then skinned the bottom with plywood, cold molding the forward section to accept the hull shape and then fitted a topside skin in similar fashion. Then we bookmatch planked the topsides with 7mm mahogany along the original plank lines. With hull planking and fairing completed the hull was epoxy coated and the bottom and chine to the waterline sheathed with double bias glass cloth set in epoxy. The waterline was struck and the bottom painted in time for a visit from our now excited clients. We rolled the boat upright after they had departed back to Sydney, and set to work on deck and cockpit framing. 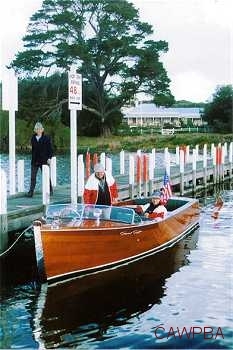 David had requested we customize the boat to suit his lifestyle. He had indicated that there was little room for him to comfortably sit at the helm and that he would like seating for eight. We had decided to repower with a 270HP Mercruiser and had determined its position to maintain original hull balance. He liked the Utility layout but wanted more permanent seating forward of the engine. We suggested a full bulkhead in front of the motor with seating forward and a step through to helm and front passenger seats. 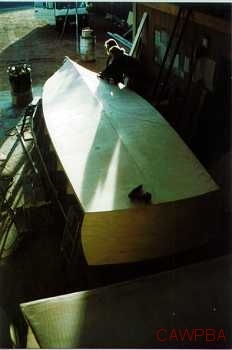 To make it all fit we would shorten the foredeck 200mm. It was drawn up and started to look balanced and in keeping with the project brief. So, quite literally, we built the seating around our client. 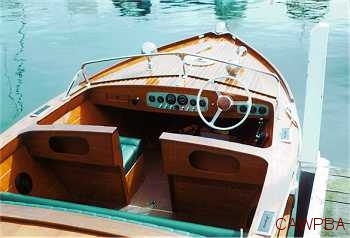 The dashboard and laid mahogany/ash decking and coverboards, also bookmatched, were then fitted over a plywood base. With the mahogany dashboard and glove box, the effect is stunning. The new motor was fitted along with all new drive train, rudder and steering controls. The enlarged fuel tank was fitted behind the rear seats and under the aft deck. A new sole was fitted and tilting engine box cover laminated with mahogany. Everything removable was removed and then the new work epoxy coated before application of copious amounts of two pack varnish. A custom windscreen was cast and fabricated from patterns made from copying old Chris Craft photos. Other deck fittings were sourced from the US but we fabricated our own custom cutwater and stern plates. The seats were upholstered to compliment the rest of the boat. Our seatrials the day before delivery went without drama. In fact, it was just a hoot blasting around the lakes with the wind in our hair and the growl of a V8 in our ears. Delivery to David and Pauline the next day was even better. Which is just the way it should be. 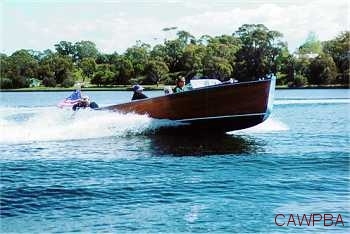 At our small business on the Gippsland Lakes, Victoria, we repair, restore and build wooden boats. 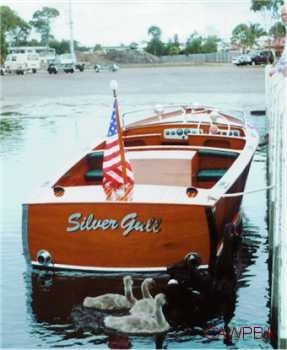 The Silver Gull project was a rebuild around some original components. We were faithful to the original shape, well, as best we could, but the driving force was sentiment, nostalgia and no fuss motoring. No attempt was made to rebuild using original methods, materials and techniques. We believe the result is a better boat than original. It is certainly stiffer, drier, can go a great deal faster and requires less maintenance. It also meets with our clients needs, one of which was to ferry his son’s bridal party down Sydney Harbour for a gala wedding. This, with a party of 10 on board at 30 knots, it did so admirably. What our clients really want is perhaps the most critical parameter. After all, it is our clients that keep us in business doing what we like to do. And at the moment, what we like doing is restoring a Riva Aquarama and a 1940’s sedan cruiser alongside the new build of a 1924 John Hacker designed gentleman’s racer. And that can be another story.